At the age of 24, Joshna Wandile and her two children were thrown out of the house she shared with her in-laws after her farmer husband hanged himself. He left a pile of debts after years of drought laid waste to his land.Wandile is not alone. More than 300,000 farmers have killed themselves in India over the last two decades, leaving their widows battling with the state, moneylenders, in-laws and their communities. While widows in rural India are often ostracised and abused, farmer widows have it particularly tough, activists said ahead of International Widows’ Day on Thursday.”I had nothing when my husband died – he sold everything in the house, even the cooking vessels, to pay the creditors,” said Wandile who lives in Vidarbha in Maharashtra, among the worst affected by farmers’ suicides. “I couldn’t even feel sad. I could only think: where will we live? How will I earn enough money? How will I keep us safe?” said Wandile, who was married at 17. Maharashtra, which is struggling with its worst drought in four decades, accounted for more than half the 5,650 farmer suicides in India in 2014, according to official data. Some estimate last year’s toll exceeded 3,000. “Bankruptcy or indebtedness” was the most common reason cited. Most were small farmers, with holdings of under two hectares. There is little information on the families left behind who struggle to claim their right to the land they till and the house they live in, while battling archaic stigmas that dog their every step. IN THE 1990s China had one of the highest suicide rates in the world. Young rural women in particular were killing themselves at an alarming rate. In recent years, however, China’s suicides have declined to among the lowest rates in the world. In 2002 the Lancet, a British medical journal, said there were 23.2 suicides per 100,000 people annually from 1995 to 1999. This year a report by a group of researchers from the University of Hong Kong found that had declined to an average annual rate of 9.8 per 100,000 for the years 2009-11, a 58% drop. Paul Yip, director of the Centre for Suicide Research and Prevention at the University of Hong Kong and a co-author of the recent study, says no country has ever achieved such a rapid decline in suicides. And yet, experts say, China has done it without a significant improvement in mental-health services—and without any national publicity effort to lower suicides. The most dramatic shift has been in the figures for rural women under 35. Their suicide rate appears to have dropped by as much as 90%. The Lancet study in 2002 estimated 37.8 per 100,000 of this age group committed suicide annually in 1995-99. The new study says this declined to just over three per 100,000 in 2011. Another study of suicides, covering 20 years in one province, Shandong, found a decline of 95% among rural women under 35, to 2.6 suicides per 100,000 in 2010—and a 68% drop in suicides among all rural women. Scholars suspect that the number of suicides is underreported in official figures (the official suicide rate nationally was 6.9 per 100,000 in 2012) and they make adjustments for that in their calculations. But in several studies, as well as in official data, the long-term decline in suicides has been marked across the spectrum, in rural and urban areas and among men and women from almost all age groups. The only notable exception is the suicide rate among the elderly, which declined overall but has crept back up in recent years, a worrying trend in a rapidly ageing society. Two intertwined social forces are driving the reduction: migration and the rise of an urban middle class. Moving to the cities to work, even if to be treated as second-class citizens when they get there, has been the salvation of many rural young women, liberating them from parental pressures, bad marriages, overbearing mothers-in-law and other stresses of poor, rural life. Migrants have also distanced themselves from the easiest form of rural suicide, swallowing pesticides, the chosen method in nearly 60% of rural cases, and often done impulsively. The reduction in toxicity of pesticides has helped as well. Jing Jun, a sociologist at Tsinghua University in Beijing, notes that the increase in migration to the cities fits with the decline in rural suicides (see chart). Since rural dwellers accounted for most suicides, so the national rate has fallen, too. In 20 years, as the population went from mostly rural to more than half urban, the official national suicide rate dropped by 63%. Suicides among urban residents are also dropping, suggesting other causes, too. Chinese newspapers frequently carry dramatic photos of suicidal people being rescued from window ledges and rooftops (like the woman in our picture). But the University of Hong Kong researchers found that urban suicides had dropped to 5.3 per 100,000 between 2002 and 2011, a fall of 59%. The simplest explanation is that, in spite of concerns about pollution, food safety and property prices, living standards and general satisfaction with urban life have gone up. Mr Jing also believes that, as in the countryside, the atomisation of extended families has reduced the family conflicts that can lead to suicides. via A dramatic decline in suicides: Back from the edge | The Economist. Being a government official in China is not for the faint of heart, the thin-skinned or the fragile of mind. A recent state media report has reverberated online and in the Communist Party press by revealing that at least 54 Chinese officials died of “unnatural causes” in 2013, and that more than 40 percent of those deaths were suicides (in Chinese). For some, those numbers raise questions about the burden placed on officials as a result of the Party’s anti-corruption crusade. But others see the recent rash of suicides as further evidence of the lack of political openness in China. The latest victim was Xu Ye’an, the deputy chief of China’s national-level Bureau for Letter and Calls—the agency that handle petitions from disgruntled citizens. According to local media reports (in Chinese), Xu killed himself in his office, those the circumstances of his death remain unclear. Then there was Zhou Yu, a senior police official in Chongqing and a major player in the anti-gang crackdown there a few years ago. He was found in a hotel room having apparently hanged himself (in Chinese). There was also the deputy director of a neighborhood construction management office in a small city in Zhejiang province, who was responsible for overseeing building inspections at a time when an entire apartment building collapsed, was reported to have committed suicide in disgrace (in Chinese). That Chinese officials have had to deal with pressure is nothing new. 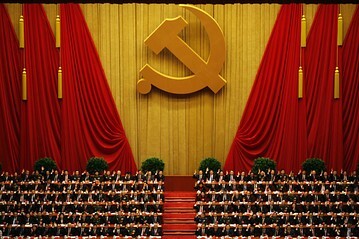 via The Mystery Shrouding China’s Communist Party Suicides – China Real Time Report – WSJ. What’s driving Chinese officials to suicide?